The more I use this iPad, the more I am convinced that it is the logical and necessary next step for students. It may not be the Apple brand iPad, but it’s becoming increasingly obvious that students will benefit on many levels from these ereaders. We’re in the back-to-school mode, which means the inevitable articles about backpacks being too heavy. There’s this one about a kid who’s carrying a backpack that’s 27% of her body weight. Or this one that weighs out how much each item in a student’s backpack weighs. Schools and textbooks are as necessary as they have always been, but the way we transport them is beginning to evolve. Even as I get my kids ready for school, I can see that they have too much to transport. Tough devices – Kids are not going to take good care of ereaders, particularly since they represent school and other “not fun” stuff. The device needs to be nearly indestructible. Even if it bulks up the device, a durable rubberized coating is probably necessary. Maybe the people who design the Panasonic ToughBook can help with a school-grade device. Controlled web access – As it is, parents have a tough enough time monitoring what their kids see on the Internet. A device like this would need to have parental and school control built right in, so that kids aren’t surfing inappropriate content when nobody is looking. There are many, many reasons why we should be having serious discussions about ereaders for students. But it’s almost that time, and I have to get my kids off to school. And we’re renting a forklift to get their backpacks into the car. Another day, another ereader convert. Yup, another co-worker came to the office today to show off his Kindle. He admitted that my relentless raving for the Kindle pushed him over the edge. That, and he ran the numbers, and realized that he’s actually going to spend less on his reading materials. He’s a heavy reader of new non-fiction books, so the cost of shipping alone from Amazon and BN.com was apparently adding up. He loves the Kindle and was showing it around the room. His favorite feature? His back no longer aches from lugging around books. Nice. The falling cost of ebook readers is increasing the amount of content that you can get electronically. The improved capabilities coming from the Nook, Kindle, and the Apple iPad are inspiring content creators and even marketers to look at new ways to distribute content electronically. It’s a beautiful circle of ever-increasing growth for electronic publishing. It’s a lot like the early incarnations of websites in the 1990s, except on an accelerated timeline. Like the early Internet — heck, like anything early in the development stage — the ebook and ereader market is going to experience explosive growth in many different directions. Some of them will be logical, especially in hindsight. Some directions will be surprising, and perhaps even illogical. Other directions will fizzle and be left to Net history and Wikipedia entries. People jump on new technology like it’s supposed to be fully de-bugged and realized in the first or even second release. It’s never been that way. Consider the first cars or telephones or televisions or even the first computers. These devices evolved naturally, as engineers and users determined was features were valuable and which were unnecessary. It’ll be the same way with ereaders and ebooks. You can wait it out or you can jump in and be part of the virtual team that de-bugs and priortizes our future technology. Today, one of my co-workers joined the revolution. One day, we’ll laugh about how primitive the Kindle is compared to our more advanced devices. Do you look at ereaders and ebooks and wonder “what’s the big deal?” Then you’re probably like a lot of people who understand the technology, but figure that printed books, laptops, and iPhones are good enough. Yeah, hate to break it to you, but in about two years, you’ll be using an ereader. It won’t look like today’s Kindle or Nook, but it won’t be that different either. Ereaders are an inevitable next-step technology. Paying $200 for a device like a Sony eReader when you can read a book for free? Crazy, right? Well, not so fast. Is the book you’re reading actually free or did someone pay for it already? That’s right, someone paid for the media, even if it’s in a public library. As for the device, let’s not judge future prices by today’s prices. If that were the case, nobody could afford a plasma or LCD television in their home. Early home entertainment systems are always expensive, until manufacturers can figure out a way to drive down costs. Today’s ereaders are relatively cheap for new technology. Expect cheaper prices, starting this year. In two years, they’ll be selling them at garage sales. Tech always starts high and comes down. Why read a digitial book when a perfectly good print version is there on the shelf? Well, just wait until the book you really, really want to read is only available in ebook format. Or the book that you have to read for work or school. Yeah, it’s going to happen, and sooner than you want it to. As you may know, I have published comics in the past. Nothing big, but I did enough to realize that more than 50% of my costs were going to printing and shipping. It’s the same for mainstream publishers as well. Soon, publishers will release certain books only in digital formats. It’s probably going to start with textbooks, since there are 37 million kids in US schools alone. And they don’t get to choose what they read, right? 3. Free channels will fade. When was the last time you went to a music store to buy new music? Yeah, same here. If you have an iPod, you’ve probably used Apple’s iTunes store. I love the Amazon store for new music. Every other strip mall in America used to have a record shop. Not anymore. Now, with bookstores fading into the sunset, you’re going to be forced to do some shopping online. But print books, still need to be shipped. If you buy from Amazon, that price is fixed at $3.99 (before free shipping incentives). And the costs of shipping keep going up, up, up. One day, the cost of shipping a book will be prohibitively high. So high, that it will not make sense to buy a print book over the Net. Meanwhile, the delivery cost of an ebook will tend to remain fairly constant at $0. Oh, and one more thing about “channels.” You know, when I was a young one, nobody could imagine paying for television. People scoffed at the idea of paying for cable TV, especially when you could just pull up the antenna and get reception. And yet, now paying for cable television is just another bill. In the future an ebook reader will be another device that you keep around the house for your basic reading needs. Right now, the graphics on Kindle are perfect for text. Pictures? Nah-so-good. The images are barely passable and sometimes downright unreadable. Lame. In fact, the ebook reader of tomorrow probably looks a lot like your laptop of today. Except the ereader of the future will almost certainly have a touch display. Better pictures, movie watching, and web browsing will all eventually be included in high-end ereaders. Asus today announced the DR-570, a color ereader. Brilliant color pictures and 122 hours of battery life, at least that’s what they are claiming. 5. Content creators will want ereaders. You may not pay for content, including pictures, words, and videos. Radio is free. Television is free (even though you pay for the wire into your house). But someone, somewhere is paying for it. Writers and editors and production people all need to get paid. So the people who actually create content, like publishers, and the people who pay them (the advertisers) are already lining up behind new technology. Content creators will push hard for ereaders, especially since it will give them a new way to aggregate their content. Yes, piracy will run rampant, but enough people are willing to pay for good content that it will drive down the cost of the devices. More importantly, content creators will gain access to incredibly detailed statistical reports. Old media is saddled with old-style reporting. New media advertisers want details about user behavior. eReaders will bridge that gap and make the medium instantly useful and credible in the eyes of advertisers. They will bring their dollars to this new medium, making it possible for content publishers to pay the people who create the content. As of this holiday season, there are a LOT more Kindles out there. Amazon claims that the Kindle was the best selling item in their store. Ever. Some experts put Barnes & Nobles Nook sales at over 500,000 units in 2010. And guess what? Some of them are going to break. Yup, it’s a statistical certainty. Even if only 1% of all Kindles break, there’s a lot more of them out there to be broken. If you check out some of the articles out there, people are already suing Amazon for the Kindle design. As a consumer, you should have a reasonable expectation that an expensive piece of technology has been tested and improved, right? Well, not so fast. We’re talking about a product that’s been in the wild for under two years. That’s plenty of time to get market feedback, but not really enough to make significant hardware changes to improve the product. And that’s the trouble with being an early adopter of new technology. YOU are the beta tester. It’s cool to have a new toy. People want to see it and you get to be a geek superstar. But that comes at a price. Even early iPods broke or had lousy battery life. Consider Toyota. Toyota worked hard to build their image of reliability, but they did it over many, many years. It didn’t happen in the first year of production. Personally, I keep my Kindle in a thick, zip-lock pouch. It’s not a traditional ebook pouch. I bought mine at an Army Navy supply store. It protects the Kindle from water. Plus it’s so ugly that nobody even looks twice at it. So, if you got a Kindle or Nook ereader for this holiday season, congratulations. You got a cool, cutting-edge device that will give you many hours of pleasure. Amazon’s announcement that they sold a lot of Kindle 2 ereaders comes as no surprise. The big news was that, according to Amazon, the Kindle was the best selling item ever on Amazon.com. Okay, that’s big news for several reasons. For starters, the obvious is that the reading public seems ready for another tech toy, even if it’s kind of expensive and primarily a single-use device. It’s also big news for Barnes & Nobles, which seems to have missed a big opportunity by not being ready with their Nook ereader for this holiday season. I went to the B&N store near my house and checked out the Nook. It was, as I expected, just like the Kindle. I mean, other than the somewhat minor difference in navigation (that little color strip at the bottom), it looked and felt like my Kindle. Except…well, except I couldn’t buy one on impulse. Ironically, I did leave purchasing a Sudoku book as a Christmas gift. Print, for my analog father. Borders recently announced that they’d be selling ebooks. It’s sort of sad, though, since the Borders near my house is now going out of business. I’d purchased a lot of books from that store over the years and I’m sad to see them go, but Borders is starting to look like a casualty of a much larger war being waged among bigger, better armed opponents. And, addressing the 800 pound gorilla in the room, everyone is talking about the eagerly anticipated Apple tablet. The tech press thinks that it will be dubbed the iSlate or iTablet, since Apple seems to own the domain name iTablet.com. Anyway, if Apple actually enters the tablet PC market — and offers ebook reading software — this could have a significant effect on how we read and consume books. And if you read comics, a color tablet will quickly change how you buy and collect comic books. The aspect ratio of a vertical tablet will complement how current comic books are formatted. If the iTablet is like a giant iPod Touch or iPhone, as some experts predict, it will be an amazing, game-changing device. Lots of excitement out there. Sad to see Borders go. Looking forward to the iTablet. Hope the Barnes & Nobles near my house stays in business. I’m an early adopter. If you create a new website, I will visit it. Develop a new gadget, I will buy it. That’s what early adopters do. We go in early, check things out, invite you to join us, and then complain that it was better before you got here. Anyway. I’ve been talking about ebook readers a lot recently, both here online and at work. People are really starting to get excited about ebook readers, especially around the holiday season. 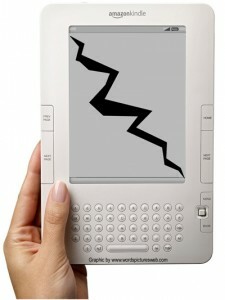 Some people (including myself) are predicting that 2010 will be a big year for ereaders. It may not be the obvious tipping point where ereaders go mainstream, but the tipping will begin to, well, get tipsy. 2. Color screens. This, of all the complaints about ereader, is the one I hear the most. When people check out my Kindle, they are immediately impressed with the eInk technology. It’s a reflective medium, so it’s easier to read then people would expect. But they fall back on, “I’ll get one when they come out in color.” The reality is that people read in black and white, not color. But color capabilities will be a major tipping point for a lot of people. Even though they’ll actually be reading the actual words in black and white, people want color. 3. An Apple solution. Apple knows user experience. If they make something, we trust that even the first version will have a quality user experience. Many of us are willing to pay a premium for that. So the day that Steve Jobs tell us “one more thing” and presents an ereader solution, lots of people will rush out and buy one. Amazon has done such a great job with the Kindle that it actually looks like a product that Apple would create. That, no doubt, has been one of the reasons for the Kindle’s early success. So if and when Apple gets into this space, we’ll see more people take ereaders seriously as must-have devices. 4. Universal micropayments. Right now, payments are still being strangled by credit card fees. If you join PayPal, you get slightly lower fees, but it’s still a pretty expensive system. Closed ecosystems like Amazon and the iTunes store are enabling publishers and retailers to produce content and set very low point-of-purchase prices. But people want to compare prices and shop at their favorite stores. Universal micropayment solutions, like ewallets (remember those), will lower barriers to products that Amazon and iTunes can’t or won’t carry. This is an industry-wide challenge. But whoever solves it, will likely become very, very rich. 5. Brick and mortar retail. I like shopping online as much as the next guy. But not everyone wants to submit their credit cards over the tubes. Barnes & Nobles and Borders are already spinning plans to create physical transactions for virtual books. At Radio Shack, I saw them selling casual games on USB keys. That’s the kind of product someone wants to have in their hands, especially if they are buying a gift product. iTunes is nice for something that you buy and download yourself, but giving someone a gift in person is more satisfying if you can hand them something. The Barnes & Nobles near my house set up a beautiful kiosk to demonstrate the soon-to-be-available Nook. Since you can’t actually touch one until you buy it, the Kindle is a leap of faith, and so are the books that you put on it. Are there other barriers to ebooks and ebook readers? Sure. Price, habit, and skepticism are among the top contenders. Heck, even having too many devices is an obvious barrier. The move from printed books to electronic books is inevitable. It’s the tipping point that fascinates me. As ebooks grow in popularity, we’re starting to see more ebook exclusive releases. What’s impressive is the recent announcement by Amazon and Archaia, a comic book publisher based here in New Jersey, (disclosure: I know the people at Archaia personally) to release a comic book on the Kindle before the print release. The Kindle 2 handles images pretty well, but it’s still black and white and, well, pretty small. So most people who create comic books (including me) are trying to understand how to best format their existing comics for ebook readers. What makes the Archaia deal so interesting is that their comic book will be formatted specifically for the Kindle a full six months before it is released in print. That gives the publisher plenty of time to decide how to package the print edition. According to Publisher’s Weekly, the first issue of the comic book “Tumor” will be free and then the next seven issues will be 99 cents, bringing the total to $7.92 for the whole series. The print edition will sell for $14.95. When you consider that many new comic books retail each week for $3.99, you have to wonder what’s going to happen to that core business. And when high-quality color ebook devices become available, will many people still be willing to pay $3.99 for a print comic when a 99 cent version is available? Now that comics are going to the Kindle, get ready for even more interesting changes in the comic book publishing industry. To explore the technology, I wanted to get something up there on the Kindle store. So I took the complete scripts for my comic book series “7 Days to Fame,” reformatted it, created a Kindle account, and published it on Amazon.com. 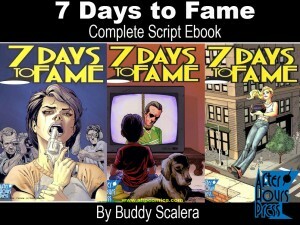 Check out my 7 Days to Fame – The Complete Scripts eBook for the Kindle. It sells for a whopping 99 cents. To be honest, it wasn’t very hard to reformat for the Kindle. Mostly it just came down to reformatting for the smaller screen and checking for bad line breaks and hiccups in the code. Just a few hours of work and now it’s done. This isn’t the first time I was part of an eBook. There’s a transcript of a podcast interview that I did a few years ago with Paula Berinstein called Writing Comic Books: A Writing Show Interview and I was a technical consultant on the photo book Artist’s Digital Photo Reference – Landscapes . But for me, this is much more fun, since I actually did the reformatting myself and published it. It’s…addictive. It’s week two or so with the new Kindle 2. Despite being an extremely easy device to use, I still found it took me time to become really comfortable with it. Like most people who saw it for the first time, I was reaching for the screen, since it really looked like it would be perfect for a touch-based interface. Maybe next version. Over the first few days, I handled it gingerly. It was transported carefully in the original box, since I hadn’t opted to buy one of the many available cases. Then, after a while, I started to just treat it like another part of my collection. Dropped it in the pocket of my heavy winter coat, and off I went. And you know what? It survived. Nice. The Kindle 2 is proving to be a tough, road-worthy companion. Right now, I primarily subscribe to the New York Times daily and one of my favorite blogs, which is Read Write Web. And despite a few gripes about navigating articles, I’m really impressed with K2. Durable, fast, convenient. So far, so good.